The Japanese company Shimano was established already in 1921. Nowadays, Shimano is one of the most important and successful producers of bicycle components and accessories worldwide. Especially in the field of bicycle gearing systems Shimano had become the world market leader in all price classes. Therefore, it is not surprising that Shimano entered the booming electric bike market, too. In the year of 2010 the company presented its first electric bike drive system called “Shimano STEPS” (“Steps” stands for “Shimano Total Electric Power Systems”). However, this first version had a front engine and was no great success, especially due to its relatively low range. Therefore the Shimano STEPS drive system has been completely revised and optimized. As a result, in the spring of 2014 the new version of the Shimano STEPS system was brought on the market – but this time with a mid-mounted engine and a much greater range. The new Shimano STEPS System 2014, consisting of mid-mounted engine, battery, bike computer (display with range indicator and much more), crank shaft and chain, allows Shimano to keep up with the competition by the mighty Bosch company. The new Shimano mid-mounted engine scores with a powerful performance, low weight and a harmonious driving behaviour. Furthermore, the systems battery has a quite high range (up to 150 km in the Eco-mode). It is important to distinguish between two different Shimano STEPS drive systems, namely the classic E6000 and the new E8000 drive, which has been specially designed for e-mountain bikes. The compact, lightweight Shimano STEPS DU-E6000 drive offers a torque of 50 Nm. You can choose between 3 different drive modes (Eco, Normal & High). In the Eco mode, the battery provides a decent range of up to 150 km. There are several recommended tuning options for this drive. The E8000 is a completely redesigned, particularly powerful drive that has been specially developed for e-mountain bikes. The engine scores with an extremely low weight (less than 3 kg). The maximum torque is 70 Nm. The battery power of the E6000 has been increased from 418 Wh to 500 Wh. In addition, the display is no longer located in the middle of the handlebars (as with the E6000), but on the right-hand side in the triangle of stem and handlebar. You can choose between 3 support modes (Eco, Trail, Boost), which can be controlled via handy Firebolt gearshift levers, which should ensure a particularly harmonious shifting. For many experts, the system is now regarded as one of the very best MTB drives on the market - the driving experience should be extremely similar to that of conventional mountain bikes without an engine. With the Badass Box 4, the eMax Sensor and the eMax software, there are already several recommended tuning tools for this system. Important note: The E8000 Shimano STEPS motor is compatible with Shimano's 10- or 11-speed electronic or mechanical switching components. Some E8000 drives are also equipped with the electronic Di2 mountain bike gearshift system (to ensure especially clean shifting processes). A good tuning solution for Shimano electric bikes with Di2 is the Badass Box 3.3 “Freeze”. A recommendable software-based tuning solution for E8000 with Di2 is the innovative eMax software. Shimano STEPS mid-mounted engines are built into electric bikes by many well-known brands - this fact clearly speaks for the quality of the new Shimano STEPS system (Fous, Bulls, Hercules, Falter,...). 3 Is it possible to optimize / tune Shimano STEPS engines? Yes! Due to the fact that the new Shimano STEPS system is already used by some important electric bike manufacturers, it is no wonder that there already are (at least) some suitable tuning tools on the market. 4 Which Shimano STEPS Tuning Tools do exist? The best version of the reliable badassBox for Shimano E Bikes so far. This very compact tuning tool takes away the 25 km/h speed limit of Shimano pedelecs, which allows you to drive much faster with full engine support. The installation of this tuning tool is very simple and can be done without any problems even for absolute non-technical users. The Badass Box 4 attaches directly to the speed sensor (without intervention in the engine electronics). Thanks to a new snap lock, you can attach or remove the badassBox at any time within a few seconds to activate or deactivate the tuning (the spoke sensor must also be relocated, which is no problem thanks to the supplied Toolfree screw). Thanks to a more powerful AAA battery, the Badass Box 4 now has a significantly higher range of 7000 km or 1 year (of course you can easily replace the battery at any time). In addition, a special casting compound provides greater robustness and better protection against moisture. Made in Germany. Please note: When the tuning is activated, the display no longer shows the correct speed values. For Shimano E Bikes with electric gearshift (Di2) you need the "Badass Box 4 Shimano Freeze". This version of the SpeedBox has been produced especially for Shimano STEPS E8000 drive systems. The device takes away the 25 km/h speed limit and shifts it to 50 km/h. That means, you can ride twice as fast with 100% engine support! You can activate / deactivate the SpeedBox via the light button or by simultaneously pressing the UP and DOWN buttons. The flashing of the light symbol shows you if the tuning tool is active or not (the electric bike´s light function has to be unlocked if you want to use this device). A big advantage of the SpeedBox is the simple installation. When the device is active, the display only shows half speed. Please note that the Speedbox for Shimano STEPS E8000 engines is NOT compatible with electric bikes with Di2 gear shift systems. The SpeedBox for Shimano STEPS E6000 increases the maximum engine support from 25 km/h to 50 km/h (approx. 32 mph). You can activate the device at any time with a short press of the light button or by pressing the UP and DOWN buttons at the same time. The light icon indicates whether the tuning is active or not. Pressing the button again will deactivate the tuning. If the tuning module is active, your speedometer will only show half speed. Please note: To use this device, your electric bikes light function has to be unlocked (simply visit your local bicycle dealers - they should have got special equipment to help you). 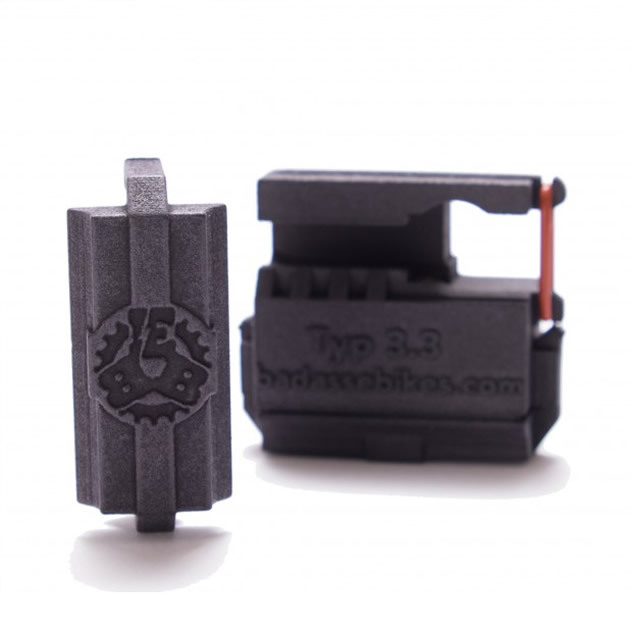 D Badassebikes Chiptuning Box Typ 4 "Freeze"
This tuning module is compatible with all Shimano mid-mounted motors (E6000 + E8000) with Di2 shifting systems. A big advantage of this tool is that it can be installed very easily within a short time. The Box takes away the 25 km/h speed limitation completely – this allows you to drive much faster with full engine support. This device switches on and off automatically. Simply remove the box if you want to cancel the tuning – drive legally within a few seconds! If you use this tuning tool, the speed shown in the speedometer will be “frozen” at a certain value (depending on the particular wheel circumference). The power supply comes from an exchangeable battery cell, which enables a performance of 7000 kilometres or approximately one year. This tuning tool shifts the speed limit of Shimano STEPS E8000 E Bike engines from 25 km/h to 50 km/h. There are 2 versions of this processor controlled tuning module, namely the "Normal" and the "Still ON" version. With the "normal" variant, the tuning can be switched on or off at any time via the electric bike´s light button. The "Still ON" variant, on the other hand, is intended for Shimano E Bikes without light function - with this variant, the tuning module is always activated as soon as the electric bike is switched on. With the PearTune MSO SH1 module for Shimano STEPS, the speedometer shows only half of the actual speed when the tuning is active. This tuning tool does not require a separate battery. 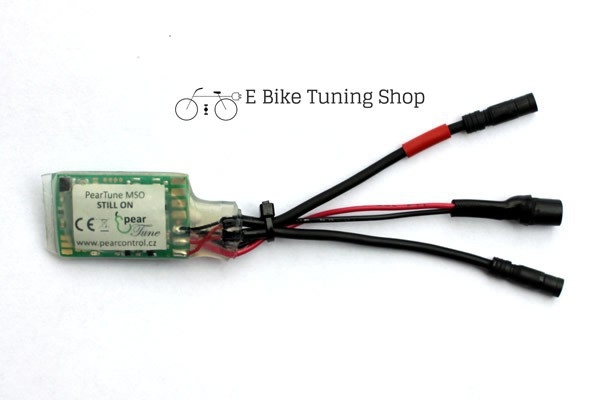 This is the practical Sx2 dongle in a version especially for electric bikes with Shimano STEPS E8000 mid-mounted engines. The 25 km/h speed limit is lifted so that you can ride up to 50 km/h with full motor support. The Sx2 dongle can be conveniently activated at any time via the bike's light switch. Very easy installation thanks to Plug & Play principle. No separate battery required. By removing the dongle you can restore your bikes original riding characteristics at any time. Please note that your display shows only half of the real speed when the tuning is activated. Important: This tuning tool only works with Shimano E8000 E Bikes without Di2 electronic gearshift.